The Washington Post’s Adam Taylor claimed on Wednesday that the Islamic State’s "extremist brand is winning" in Iraq — but how could such a thing happen in what was once the most secular Muslim country in the Middle East? ISIS’s adaptability and resilience are disturbing traits of what military analysts consider an emerging breed of “hybrid” adversary. The modern template for this theory was the Hezbollah militia in 2006, when surprisingly determined, well-trained, and well-armed irregulars bloodied the vaunted Israelis in southern Lebanon. But the reality behind the “hybrid” theory goes back at least to the Vietnamese Communists, who skillfully blended Viet Cong and regular North Vietnamese Army forces, guerrilla tactics and pitched battle: They massed their forces to invade South Vietnam, dispersed into the jungle after the US intervened, then took Saigon with tank columns once the US was gone. Their inspiration, in turn, was the Chinese Communists led by Mao Zedong, who laid out an explicit progression from political subversion to guerrilla warfare to conventional capture of territory. We forced the NVA out of South Vietnam by wielding our heavy bomber force in a brutal fashion which was only barely politically feasible for Richard Nixon, and which Barack Obama would probably never contemplate. Nixon ordered Operation Linebacker II in 1972, and more than 200 B-52s (along with about 2,000 smaller aircraft) pounded North Vietnam with the kind of massive and sustained bombardment which only large numbers of heavy bombers can deliver. American auto buffs like to say "there’s no replacement for displacement," and sometimes in war there’s no replacement for filling the sky with bombers. Today we have fewer than 80 B-52s still operational, assuming Obama could muster the political will for such a campaign. The future of warfare lies in the streets, sewers, high-rise buildings, industrial parks, and the sprawl of houses, shacks, and shelters that form the broken cities of our world. We will fight elsewhere, but not so often, rarely as reluctantly, and never so brutally. Our recent military history is punctuated with city names--Tuzla, Mogadishu, Los Angeles, Beirut, Panama City, Hue, Saigon, Santo Domingo--but these encounters have been but a prologue, with the real drama still to come. It came hard indeed in 2007, when President George W. Bush mustered the political will for the Iraq surge. Such a thing is politically impossible for Obama today, even if he were so inclined. 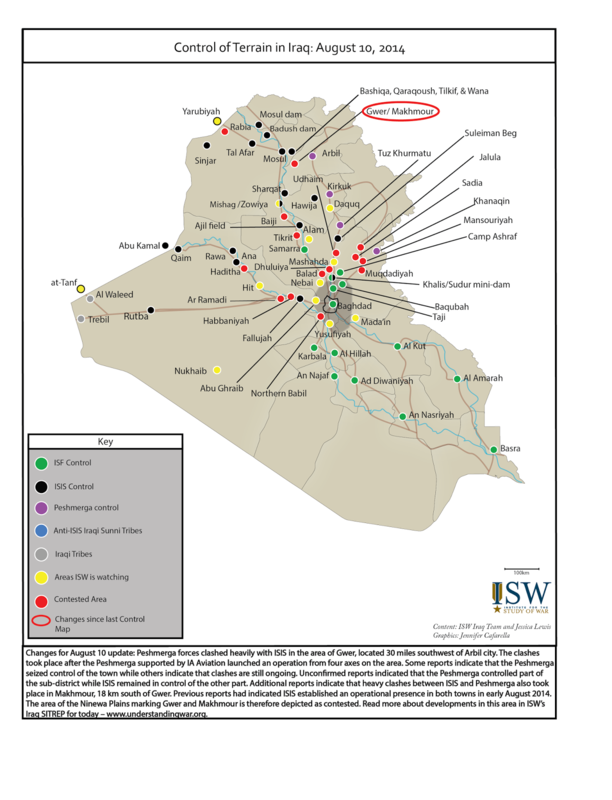 While the Pentagon glumly follows orders with useless pinprick air attacks and a couple hundred advisors, the Caliphate is working to complete its encirclement of Baghdad. Those "junior varsity" Caliphate forces have been in control of Fallujah since January, a city 95 Marines lost their lives (and another 560 were wounded) taking from Islamist forces in 2004. Ten years later, and we’re right back where we started.